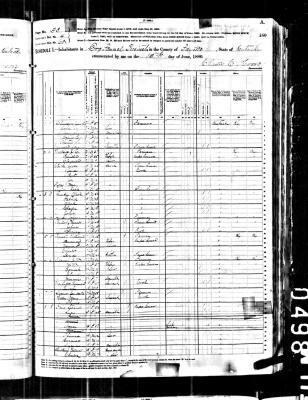 CENSUS1880* 1880� She appeared on the Census in 1880 at Dog Fennel, Fayette County, KY; She is shown as "occupation farmer" and either widowed. [S40] DAR, Sallie Scott Richardson, MVW file, This application was handwritten by Sallie Scott Richardson and then was transcribed by Stephens L. Blakely. Note* 1823� He A letter he wrote to his brother, William and a contract he signed are inserted in the family section along with the notation "John was a plasterer". [S609] Edwin Porter Thompson, First Kentucky, p. 583.